Before you can access your personal documents on the network you have to log on to the network. This chapter discusses the procedure for logging on to the network in section 2. Windows networking logon. After you have completed your work at the computer, you have to log off from the network. This is discussed in section 3. Logging out. All workstations (also known as 'client computers') in the school are connected to a central server computer via a local area network. This server serves the workstations: it holds the programs used by teachers and pupils, it stores personal documents and files of teachers and pupils and it can also be used to process print jobs. In a secure server, all users have their own 'space' where their files are stored. This space is called the 'home directory' or 'home folder'. Personal documents and files are not stored on a workstation but in this home directory on the server. In order to access documents and files in your home directory on the server, you have to tell the server who you are. You can do that by providing your 'user name'. This is sometimes called your 'userid' which is short for 'user identification'. By supplying your user name, the server 'knows' which directory is your home directory and which documents and files are yours. However, you also have to prove that you are who you say you are. If you did not have to prove your identity, anyone knowing (or guessing) your user name would be able to access your documents and files. You can prove your identity by presenting a secret password to the server. Access to your documents and files is granted when your secret password matches that of your user name. In computer jargon, the process of telling the server who you are (and proving it) is 'logging in' or 'logging on'. The reverse process - disconnecting from the server - is called 'logging out' or 'logging off'. Note that it is very important to keep your secret password a secret. If your password falls into the wrong hands, all your documents and files may fall in the wrong hands too. Therefore you should not write down your password on a little PostIt-note and attach it to the computer screen. Also, you should not keep your password in the top right drawer of your desk or taped to the bottom of the keyboard; these places are well-known. Best is to simply memorise your password. The process of providing a user name and a password is not tied to a particular workstation; you can use any workstation on the network. It does not matter which workstation you use. This is a big advantage of the network; you can pick any available workstation, log on and start working on your own documents and files. Since the documents are stored on the server and not on the workstation, there is no need to work on a particular computer to access the documents and files. Note that this also implies that there is no such thing as your 'personal' computer. Anyone could use any workstation to access their own documents and files on the server. The following conventions are used in this chapter. Special keys on the keyboard are identified by their name enclosed between brackets. Examples: [Esc], [Spacebar], [Enter]. Key-combinations, i.e. pressing and holding the [Alt] key and hitting the [U] key or pressing and holding the [Shift] key and hitting the [Tab] key are shown as [Alt-U] and [Shift-Tab] respectively. 'Press the [OK] button' means that you should move the mouse pointer to the rectangular area labeled 'OK' and click the left hand mouse button once. Note that there often are other ways to 'press' such a button, e.g. by simply hitting [Enter] or by using the appropriate keyboard shortcut, e.g. [Alt-K]. Before you can use the facilities offered by the network such as access to your personal files or printing documents, you need to make yourself known to the network as a valid user. This procedure is called 'logging in' or 'logging on to the network'. In order to successfully log on to the network you need to present a valid combination of the following three things. Your local systems administrator or your ICT coordinator should have provided you with the pertinent information for your account. NOTICE: Please do keep your password to yourself. Do not share it with others and do not write it down on a PostIt note attached to the computer. Your secret password is the key to your personal documents and files. By sharing your password, you allow others to access your files. Please memorise your password and keep it secret. The standard login procedure documented below is illustrated using the account information of Helen Parkhurst, the teacher of grade 3 (see section 2. The Exemplum Primary School in chapter II. ServerAtSchool User Manual Overview). Take the following steps to log on to the network. If necessary, switch on the workstation. Several messages may be displayed on the screen. After a while the 'Enter Network Password' dialogue appears on the screen, as illustrated below. Hitting the [Alt-U] key combination on your keyboard brings you to the 'User name' field in a single step. Hitting the [Tab] key repeatedly until the cursor appears in the field. After every [Tab] the cursor moves to the next field. Hitting the [Shift-Tab] key combination repeatedly until the cursor appears in the field. After every [Shift-Tab] the cursor moves to the previous field. Sometimes this is faster than [Tab]. Moving the mouse pointer in the 'User name' field and pressing the left hand button just once. In this example the 'User name' field is empty. If the 'User name' field is not empty, you can empty it by hitting [Del] or [BackSpace] repeatedly. Type the userid into the field (here: 'hparkh'). Do not hit the [Enter] key just yet. Move the cursor into the 'Password' field by hitting the [Tab] key once. (You can also hit [Alt-P] or use the mouse). The 'Password' field is always empty. Type the password into the field (here: 'ahgiesah'). The characters you type will be shown as asterisks. This is a security measure. Do not hit the [Enter] key just yet. Verify that the 'Domain' field matches the Windows domain to which you wish to log on (here: 'EXEMPLUM'). If necessary, move the cursor to the 'Domain' field (with [Tab], [Alt-D] or by using the mouse) and type the required information into the field. Do not hit the [Enter] key just yet. The 'Enter Network Password' dialogue now looks like this. Confirm the information you typed into the dialogue by hitting the [Enter] key or by pressing the [OK] button using the mouse. At this point the logon script is executed, as illustrated below. The fact that the window with black background appears on screen indicates that the workstation has made contact with the network server. 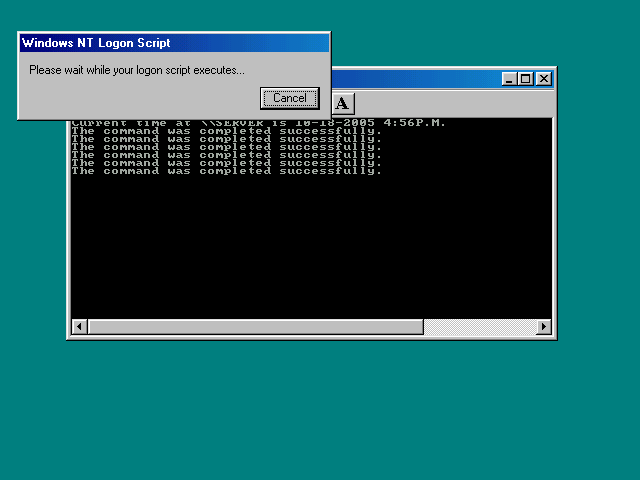 After the logon script is executed, the personal profile is copied to the workstation. This is indicated by the 'Creating User Profile...' message window, as illustrated below. This message is shown only for a brief moment. 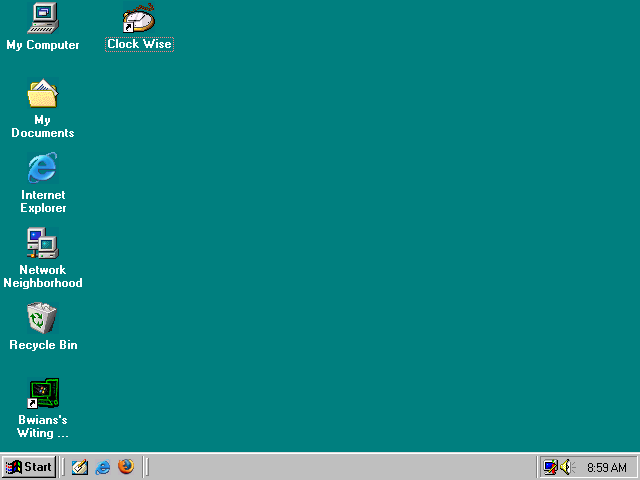 At this point the (personal) Desktop of the user (here: Helen Parkhurst, userid 'hparkh') appears, as illustrated below. The network logon is now completed. You can verify that the network logon was completed successfully by inspecting the Start Menu. If you open this menu, by pressing the [Start] button in the lower left corner of the screen or by hitting the [Ctrl-Esc] key combination, you will see an entry 'Log Off Hparkh', as illustrated below. Press the [Start] button again to close the menu. Please refer to section 2.4 When things go wrong if you encounter problems with the login procedure. In ServerAtSchool pupils generally access the network using a 'nest' account. These are accounts which are used by all pupils of a particular grade (class, group). In order to successfully log on to the network a valid combination of 'user name', 'password' and 'domain' must be presented. Depending on the school's policy a nest account can have a regular password, just like any other account, or the account can have no password at all. If the nest account does have a password, the procedure from section 2.1 Standard login procedure above applies. If the nest account has no password, the login procedure is slightly different. This is illustrated below using the account information of grade 3 (see section 2. The Exemplum Primary School in chapter II. ServerAtSchool User Manual Overview). Take the following steps to log on to the network using this account. Type the userid into the field (here: 'grade3'). Do not hit the [Enter] key just yet. The 'Password' field always empty. In this case nothing needs to be entered here. 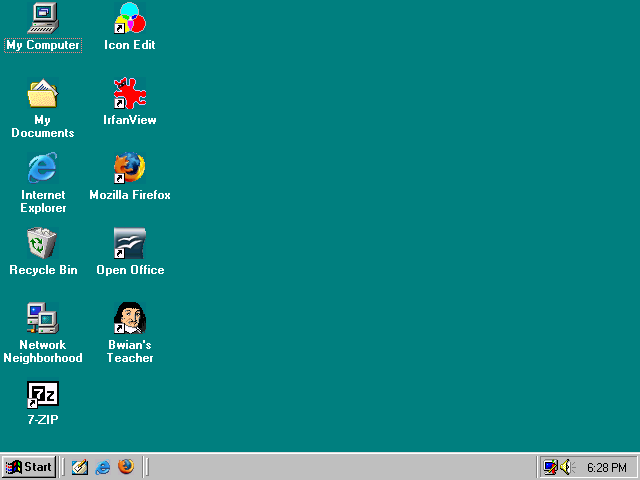 At this point the Desktop of the nest (here: Pupils of grade 3, userid 'grade3') appears, as illustrated below. You can verify that the network logon was completed successfully by inspecting the Start Menu. If you open this menu, by pressing the [Start] button in the lower left corner of the screen or by hitting the [Ctrl-Esc] key combination, you will see an entry 'Log Off Grade3', as illustrated below. In ServerAtSchool pupils generally access the network using a 'nest' account. These are accounts which are used by all pupils of a particular grade (class, group). However, it is also possible that individual pupils are allowed to access the network with an individual account. Depending on the school's policy such an individual account can have a regular password, just like any other account, or the account can have no password at all. If the individual pupil's account does have a password, the procedure from section 2.1 Standard login procedure above applies. If the individual pupil's account has no password the procedure from section 2.2 Login procedure for pupils using a nest account above applies. Workstations at school live a complicated life. Well trained teachers use them as if the workstations are their home computers (which they are not). Lots of pupils learn how to use a computer (that is what they are for) and pupils have a natural inquiring tendency. The previous sections document the cases where nothing goes wrong during the login procedure. However, there are many reasons why the login procedure may fail. Some of the more common causes are discussed below. The login procedure as described assumes that nothing is shown in the 'User name' field in the 'Enter Network Password' dialogue. Sometimes, however, this field shows the user name of the person that has used this workstation before. This is illustrated below with the account 'ffrint'. Freddie Frinton was here. He was the last one to use this workstation (Freddie's userid is 'ffrint') and Windows has remembered the name of the last user that logged in. It is also possible that you will see some text that does not look like a user name, as illustrated below. The software on the workstation was renewed and you happen to be the first user to log in after this has happened. Removing the existing information by hitting [Del] or [BackSpace] repeatedly. It can happen that the system denies access even though you are absolutely sure that you presented the correct combination of 'user name', 'password' and 'domain'. You may want to check the following possible causes. Are all cables actually connected (power cord, network cable)? Did you accidently press [CapsLock] somewhere along the way? The system may consider the user name 'hparkh' and 'HPARKH' to be different. This is easy to spot. However, the system may also consider the passwords 'ahgiesah' and 'AHGIESAH' to be different. That is much harder, because only asterisks are shown in the password field. Did you make a typing error in either 'user name', 'password' or 'domain'? The difference between 'EXEMPLUM' and 'EXENPLUM' is easy to overlook. You can retry the procedure but this time explicitely retyping the information for all three fields, making sure that you did not make any typing errors. Due to yet insufficient eye-hand coordination or not fully developed hand locomotion, pupils can accidentally press the [Cancel] button instead of the [OK] button in the 'Enter Network Password' dialogue. Alternatively the pupil may have hit the [Esc] key instead of the [Enter] key to confirm the dialogue. The effect of either action resembles a valid login. However, the pupil has not established a connection between the workstation and the the network server; no network logon script was executed and no personal profile was copied. The difference between a valid logon and a non-logon can be seen by pressing on the [Start] button and observing the menu that opens. The fact that an entry 'Log Off...' exists indicates a non-logon. This is illustrated below. In case of a valid logon, this entry would include the user name, e.g. 'Log Off Grade3...' rather than the plain 'Log Off...'. The remedy is as follows. Navigate to: Start | Log Off. The 'Log Off Windows' dialogue appears. Press [Yes] to confirm the dialogue. The 'Enter Network Password' dialogue is displayed again. Retry the login procedure. Do not press the [Cancel] button and do not hit the [Esc] key. There are even more reasons why a login procedure fails. For example: every year during the summer holiday the school is cleaned and in the process all workstations are disconnected and/or moved to another classroom. Of course the local systems administrator or the ICT coordinator reconnects all cables afterwards but it may happen that a power cord is accidentally unplugged when not fitted tightly into the computer. Another example: someone tripped over a cable, disconnecting the network. As a result, the workstation appears to work but no connection to the network can be established. Yet another example: someone accidently mixed up the keyboard and the mouse, attaching the mouse to the keyboard connector at the back of the computer and attaching the keyboard to the mouse connector. All this (and more) may result in a seemingly dead workstation, a black screen, a blue screen or strange error messages, the list goes on and on. When you experience some strange behaviour of a workstation, the following basic troubleshooting tips can be helpful. Please start with the first step. When logging in, the pupil gets an error message. However, you are absolutely sure the user name is type correct. Did you also double-check the Domain? There is only a slight difference between EMEMPLUM and EXEMPLUM. Black screen? Check if power is available; i.e. do you see some power light on the workstation and the monitor? Do a quick check on the cabling. Are all cables connected? If you can not immediately 'fix' the workstation, try using another workstation. Report the error to the ICT coordinator. Ask your local systems administrator for help. NOTICE: If you report problems to the ICT coordinator or the local systems administrator, please make sure that you provide as much relevant information as possible. At the very least indicate which computer was causing you problems (the computer number should be written on the computer case with a felt tip pen). It is also very helpful to explain what you were trying to accomplish and also exactly what you have tried in order to resolve the problem yourself (e.g. checking the cables, trying another workstation, etc.). Depending on the school's policy there may be an official 'problem report form' either on paper or on-line that you can use for reporting problems. Ask your ICT coordinator. After you are done using the facilities of the network you need to end your session with the workstation, freeing the workstation for another user. This process is called 'logging out' or 'logging off'. It is important to log off after each session. If you simply walk away from the workstation without logging off, somebody else can use the workstation using your account and modify or even delete your documents and files. The logout procedure works the same for all users, there is no difference between logging off with a teacher account or a pupils account. The procedure documented below is illustrated using the account information of Helen Parkhurst, the teacher of grade 3 (see section 2. The Exemplum Primary School in chapter II. ServerAtSchool User Manual Overview). Her userid is 'hparkh'. Take the following steps to log off. Navigate to: Start | Log Off Hparkh. You can do this using one of the following methods. Hitting the [Ctrl-Esc] key combination to open the menu, using [CursorUp] to move the menu cursor to the item 'Log Off Hparkh' and hitting [Enter]. Hitting the special [Start Menu] key (available on some keyboards) to open the menu, using [CursorUp] to move the menu cursor to the item 'Log Off Hparkh' and hitting [Enter]. The Desktop becomes grayed and the 'Log Off Windows' dialogue appears, as illustrated below. Confirm the dialogue. You can do this using one of the following methods. Pressing the [Yes] button using the left hand mouse button. Hitting the [Alt-Y] key combination. Note that if you change your mind, you can hit [Esc], [Alt-N] or press [No] to cancel the procedure. You then return to the Desktop and you are not logged off. At this point your personal settings, which may have been changed during your session with the computer, are copied back to the network server. This is the complement of the 'Create User Profile' message you encountered during the logon procedure. The message box is displayed only briefly. After a while the 'Enter Network Password' dialogue is displayed once again. The workstation is now ready for the next user to login. Note that (in this case) the name of the user that has has just logged off is retained in the 'User name' field. NOTICE: If a particular workstation is always or almost always used by the same user, it is very convenient that the user name is retained. This is often the case when a workstation is located inside a classroom and this workstation is used by pupils who login using a 'nest' account. In other cases, e.g. workstations in a special computer classroom, it can be inconvenient to be forced to remove the previous user's name every time you want to login. It depends on the school's policy if the last username is retained or not. Ask your local systems administrator for more information. In this chapter the procedures for logging in and logging out are discussed. You may want to print this chapter and keep it for future reference.